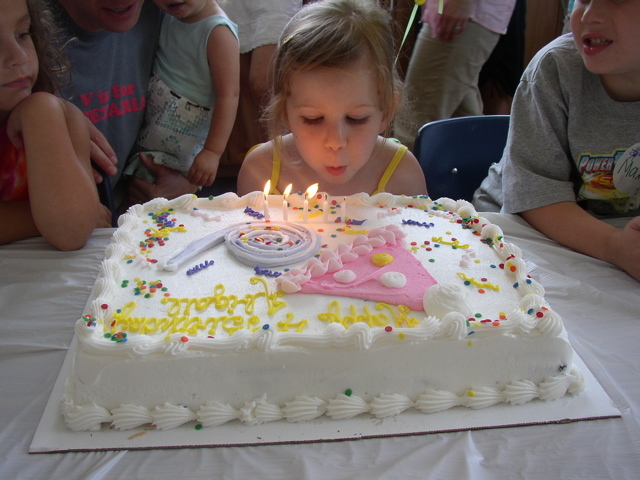 She had a lovely party at The Little Gym in Narberth, which she chose early and confidently. She loved every aspect of it and she and her guests had a blast. She especially loved the big air trampoline and thought the circle time where everybody shared their favorite ice cream was hilarious. She said her favorite ice cream was chocolate. Last year it was strawberry. She's already announced loudly that her fifth birthday party will also be at Little Gym, though she also said that she wants a swim party. I'm not sure how she thinks we can combine those, but she gravely told me that by the time she's five, she'll be a great swimmer for her party. So this may be the part where mommy just nods and smiles and lets the inconsistency play out for her on its own. I'm curious to see where we end up in another year! Her cake was delicious, but not quite the princess/ballet cake she wanted, but who can resist gigantic Costco chocolate sheet cake with cheesecake filling? She was impressed with the cake's size, so I think I did the right thing. After all, at some point the "quantity over quality" lesson when it comes to desserts is inevitable, in our family. She didn't seem upset about the lack of theme on the cake. And the days and days of leftovers were another perk. Maddy was in heaven at the party. Never had she seen some many things to crawl up, over, and through. She ran around and tried her hardest to keep up with the big kids. She reminded me of PJ in Family Circus in the way she made her way around the room, at breakneck speed. All in all, it was a lovely party, a lovely day, and my little girl is four years old. Four!